In 1984 on the southeast corner of 19th Street and Grand Avenue in Billings, Montana, Magic City Floral was established by Mark and Dannette Barth. Mark, having been a floral designer since 1972, has seen many changes in the industry but one thing has never changed – his commitment to quality and service. 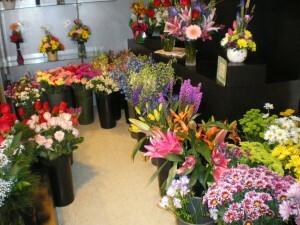 We receive several shipments of fresh flowers each week to make sure you get the freshest flowers available. We also have a good selection of green and blooming plants. If you are ever in need of fresh flower delivery in Billings, call Magic City Floral for fast, courteous service. Over the years we have grown from selling only flowers and plants to antique furniture, giftware, home décor, garden items, and women’s accessories. All are tastefully displayed in our 3500 square foot shop. Delivery is available to all hospitals, mortuaries and most of the Billings area. A delivery fee of $8.95 is added to each order. We will do our best to fulfill any special requests but we can not guarantee it. Mark, Dannette and staff look forward to assisting you with your floral and giftware selections. So pick up your smart phone and call us or place your order online. You guys are amazing. Thank you so much. I will recommend you as often as possible. I wanted to let you know how much I love the birdhouse arrangement I received yesterday. It was just perfect. We want to thank you for the beautiful spray and side bouquets you did for our mother’s funeral. Hi, I ordered some flowers from you last Friday for my Mom’s birthday. I just wanted to send a note of thanks because apparently they were the best flowers she had ever received. The sunflowers were especially wonderful. So thanks for putting together such a great arrangement for a reasonable amount of money. We truly appreciated the care you took to create the beautiful flower basket and wreath on such short notice for our Mom’s memorial service. Thanks to all of you for the beautiful flower arrangements for my Dad’s memorial service. You are the BEST. I have never seen a more beautiful arrangement than the casket spray and the spray you did for the grandchildren for the service of my mother. Thank you again. Thank you – the flowers were beautiful. The arrangements you made for the memorial service were beautiful and exactly what we wanted. We appreciated you kindness and generosity in our time of loss. I love this e-mail delivery confirmation! I wonder if items get delivered and this resolved all questions! Thank you again for such beautiful work and great service! Thank you so much for the beauty you gave to a final celebration. The flowers made it even more beautiful and memorable. God Bless! Thank you for the beautiful flowers you did for my wedding. They couldn’t have been more perfect. It was exactly what I wanted. Everyone went on and on about how beautiful they were. Thanks – I understand that Mark delivered personally! How nice! Thank you for the beautiful arrangement for the ceremony for our mother. It was gorgeous. Your guys are so cool….again, thank you so much for making my lady HAPPY… “Happy wife, happy life” May peace be with you always. Wanted to say thanks very much for the beautiful flowers for our mom’s funeral. All of the flowers were absolutely stunning and everyone remarked about the aesthetics of the service! With sincere gratitude, as always. My daughter got her flowers and they were beautiful. Thank you so much. Thank you so much for the beautiful display of memorial flowers for my fathers funeral. Your talent and advice was so appreciated in honoring him. I took a photo of Dad’s picture with the flowers around it to keep long after the flowers faded. May God bless you in your business of bringing comfort and joy to those in need – as was my family. Thank you so much for the beautiful bouquet you prepared for my husband’s funeral. We were definitely impressed and will be back for more.